As we embark on the second half of the year, with its new crop of anticipated releases, we pause to share a marketplace pulse-check. Which categories are growing? Which formats are on the rise? Using newly released data from the Association of American Publishers (AAP), along with data from the U.S. Bureau of Economic Analysis and Bookscan, we answer these questions and more. The book marketplace continues to remain stable. 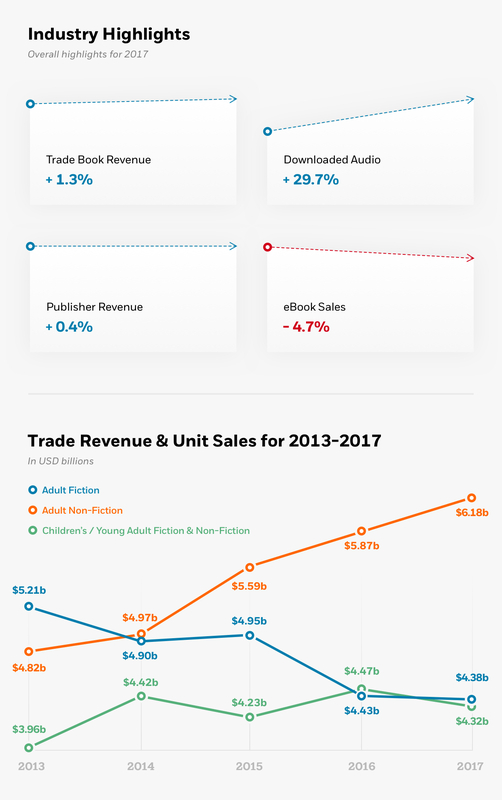 According to recent AAP figures, overall publisher revenue for 2017 was basically flat at $14.7 billion, up $57.5 million (+0.4%) from 2016. Notable trends during this time period include a rebound in trade (consumer) books and continued double-digit growth for audio. While ebook sales declined (-4.7%) for the third consecutive year, the pace of decline appears to be slowing down. The above highlights show a positive outlook for the future of book publishing. The increase in audio is a trend that we have covered in the past, and the significant growth has been attributed to a rise in podcasts and the popularity of digital downloads. The audio team at Penguin Random House continues to look for new ways to increase awareness of our authors and titles. 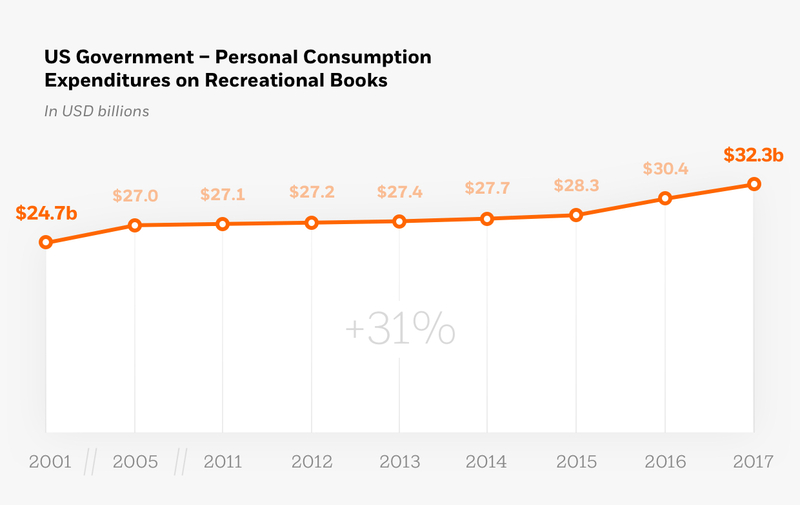 Looking to U.S. government data from the Bureau of Economic Analysis, we see another trend forming in personal consumption expenditures on recreational books. This data specifically focuses on reports from trade publishers. From 2005–2014, figures slightly but steadily climbed from $27.0 to $27.7 billion dollars. But since 2015, we’ve seen a roughly $2 billion per year increase in the industry. Keeping in mind that we are comparing different sets of data, we cannot point to one reason for this increase, but this upward trend shows that Americans are clearly spending more money on books now than ever. As we look to Bookscan’s print-only U.S. data to fill in the gaps, one statistic that stands out is that books for children and young adults remain the fastest-growing category in most book markets. In the following graph, we show more than ten years of U.S. data measured in print units sold per year (in millions). As the Harry Potter series ended, Twilight—then later, the Hunger Games trilogy—sparked early growth in the market. 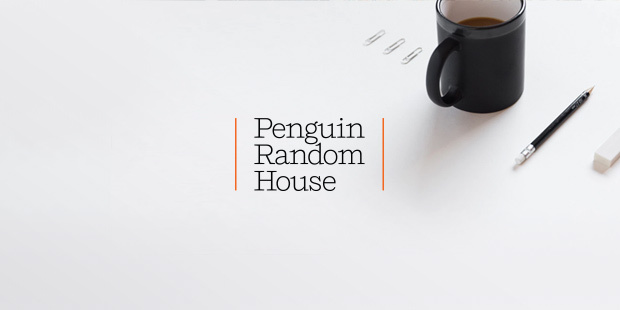 Breakout books from Penguin Random House authors, such as John Green’s The Fault in Our Stars (2012) and R. J. Palacio’s Wonder (2012), contributed to the trend, resulting in a 51 percent increase in units sold from 2006 to 2017. 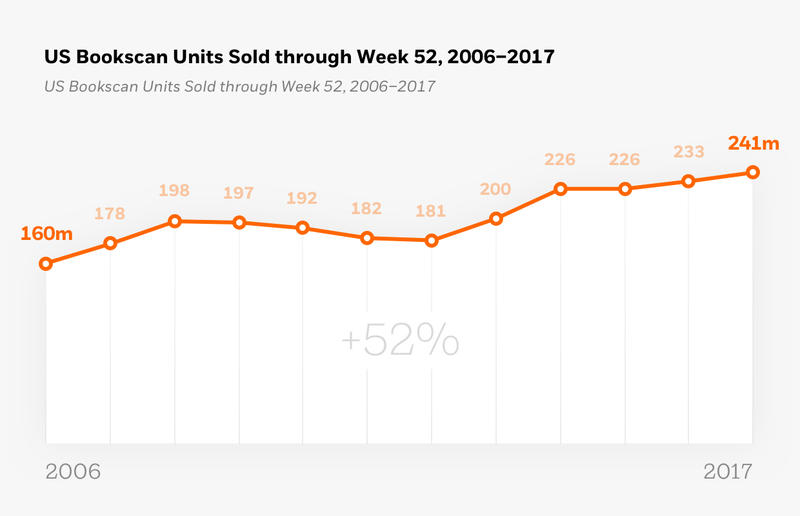 As think pieces and rumors about the “death of the publishing industry” get fewer and farther apart, thanks to years of debunking, the data continues to show a positive outlook. Though this is a brief look into a massive industry, the summary is simple: New trends are thriving, books are still selling, and people are still reading. As always, keep writing great books.